Entire families work as indentured labours in the desert of west Gujarat near Zainabad. Their task is to produce salt from the monsoon rains as they are filtered through this salty land via a series of hand-constructed salt pans. Salt pan families work around 13 hours a day in this intense landscape where temperatures reach 50 degrees in the summer. In winter, 30 degrees during the day is normal; at night the temperature drops dramatically and can be uncomfortably cold. There are no shops or markets nearby; food, water and fuel are brought in once a fortnight. The land is barren, so there is little fuel for a fire to warm them on cold nights or trees to provide shelter from the heat and wind. Education is barely available to the many children and what is available, is distant and limited. There is no access to medical or other care, so mother and child mortality is high, and early death is inevitable to all. It is harsh and difficult life. Download further information : salt_panworkers . A shy salt pan child greets Alex on our first visit to the desert. A desert camp and the location of the art project. 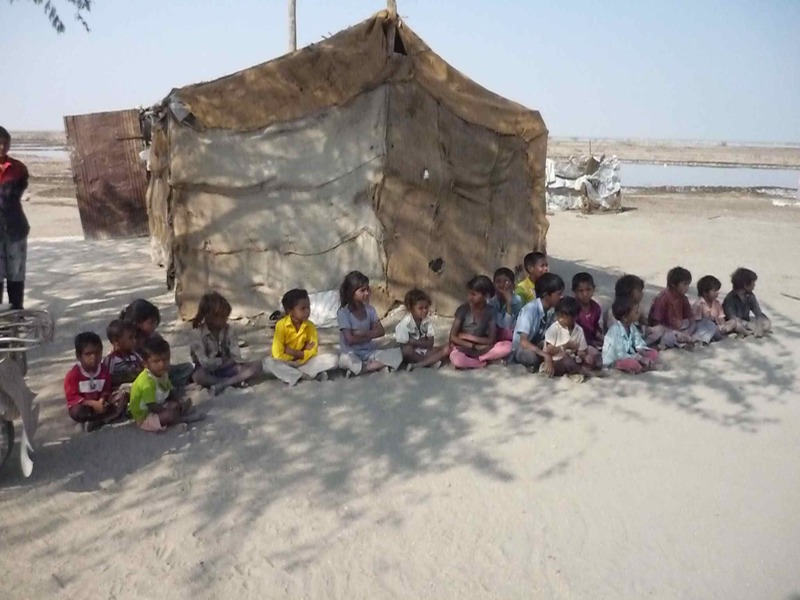 We learned about the plight of these families from Dhanraj Malik when we went to the Rann of Kutch desert to see its unique wildlife. (www.desertcoursers.net). Dhanraj is the grandson of the last Sultan of the area and has strong links with the people of the Rann as well as the many villages nearby. We met some of these families, saw first hand the paucity of their conditions and felt the intensity of the winter desert heat. Alongside this terrible existence, the landscape, its wildlife, its eerie beauty and vastness is awe-inspiring. 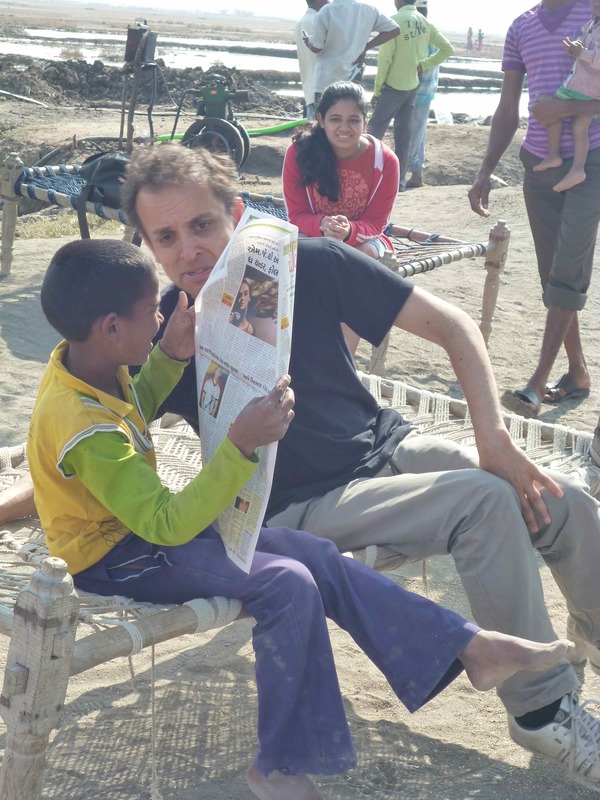 Dhanraj was fascinated by our community work and invited us to provide the first creative experience to salt pan families “in two million years!”. It was an offer that matched our own wishes to give something to these people. We all wanted to provide a memorable experience for these families; Dhanraj’s contribution was providing a feast, as well as providing the materials, and hospitality to us during our visit. He is a very generous and community minded man. We wondered whether these people would understand the concepts of art and drama, or whether because of their extremely limited education, they would know what an oil pastel is for, or whether indeed they were able to hold and use them. Illiterate and uneducated people often lack these basic skills – such as using writing utensils. We wondered whether the profound isolation would affect their sociability, and expected the chance of any of the community being familiar with well-known TV shows or films would be small. We also wondered whether because of all these impediments they could concentrate or even be interested in what we had to offer. We arrived at the desert community to find children and families waiting enthusiastically to be part of this creative community day. As usual, we bounced back and forward between art making and doing drama – this method is a great to energise the group and keep participants’ interest. The drama is lively and fun, where the art is usually quieter and relaxing. Alex : “I approached the workshops with a particular sensitivity toward their unique circumstances; I didn’t expect high energy levels because of their lack of food so the focus was more on detail and precision of mime work, rather than high-energy clowning. Child learning the newspaper gag. Anne : “I planned an activity that would bring colour to a muted landscape and one that would be successful regardless of their skills. I planned to create a series of colourful flags. Dhanraj suggested we used some old bedsheets from his hotel, which we cut up and had strings attached in the nearby village. Children were invited to draw patterns and images on the small flags. At first they were a little tentative but soon all were totally engrossed, mothers and fathers soon became involved. We dipped the flags into coloured ink which created a beautiful background to the oil pastels”. Anne showing the drawing techniques. A wonderful thing about India is that there is always many hands to make light of hard work. Community members dug into the desert ground to erect bamboo poles, children were hoisted on father’s shoulders to reach tie the string upon which to hang the flags. In such an isolated and desolate place we found such enthusiastic willingness to help make the project a success. Community projects sometimes intersect with a level of cynicism, but here we really felt a whole-of-community involvement. A huge mat was laid onto the dusty desert for the bountiful feast which arrived around midday. Children sat around the edge. One by one each child was served rice and a range of curries and Indian sweets by the men from the Desert Coursers. Each waited until all were served and the men were seated in the middle with their lunch, before beginning to eat this beautiful meal together. Due to custom, the women ate separately inside the hut. Dhanraj was inspirational in making this art project happen in the desert – the first in two million years. Another truly inspiring encounter from Anne and Alex at artists in community. I hope for all involved it won’t be another two million years before they can share another such rewarding experience.